CLEARWATER BEACH, Fla. – Two Vessel Assist members, including one based in San Diego, were honored during the annual BoatU.S. Towing Services conference in Clearwater Beach, Florida, Jan. 15 for their responses to distress calls. Capt. Brett Thompson was given the Woody Pollack Award for his response to a mayday call off the coast of San Diego. Thompson was aboard Vessel Assist Shelter Island and, in November 2014, responded to a distress call from Heather Anne. The captain of Heather Anne made several “Mayday Coast Guard” calls but with no response, according to BoatU.S. However, the mayday calls and lack of responses were picked up by the Vessel Assist dispatch center in Costa Mesa, California. Heather Sheward, assistant vice president of towing for Vessel Assist, responded to Heather Anne’s mayday calls and discovered the ship’s captain had a stroke. Sheward reportedly continued communicating with Heather Anne, a commercial vessel, as Vessel Assist Shelter Island, which was in the vicinity and helmed by Thompson, made its way to the distressed ship’s location about a half-mile from Point Loma. According to reports, Thompson, Capt. Shane Thompson and Mate Tom Butler went aboard Heather Anne and brought her captain onto Vessel Assist Shelter Island. Once aboard the Vessel Assist ship, Thompson and his crew brought Heather Anne’s captain to shore for medical assistance. Within 21 minutes of the distress calls, EMTs were reportedly waiting for the Heather Anne captain; he survived. Vessel Assist relies on a series of VHF radio towers placed along the tops of the coastal California mountain range to provide long-range communications with vessels far out to sea and beyond normal VHF radio range. The radio towers, referred to by Vessel Assist as high sites, are connected to 24-hour dispatch centers, such as the one in Costa Mesa. 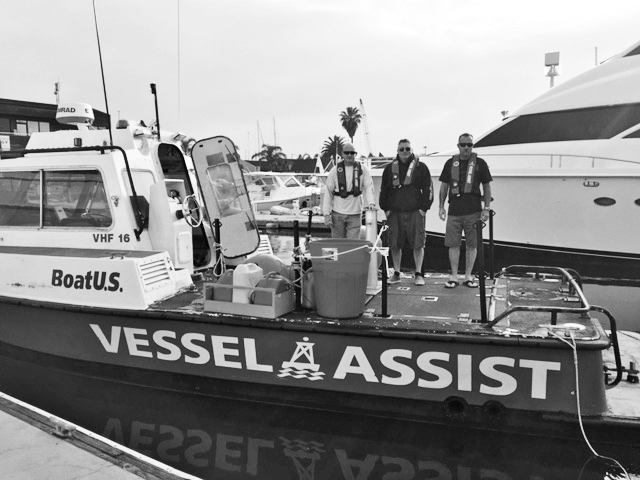 Primarily a service assisting recreational boaters with routine or unexpected breakdowns, Vessel Assist every so often responds to lifesaving emergencies. Also honored was Capt. Bob Macko from Buffalo, New York. “We are not [in] the rescue business, but our captain’s actions save others,” BoatU.S. Vice President and Director of Towing Services Adam Wheeler said. The award is named after Woody Pollack, a towboat captain with the Vessel Assist fleet who died at a young age.